Darlene Courtois, a Medicare patient, says she had never heard of kwashiorkor, a severe form of malnutrition. But federal records show her hospital billed Medicare for treating her for the condition. SHINGLETOWN – As far as Medicare knew, Darlene Courtois fell ill last year with kwashiorkor, a dangerous form of malnutrition usually seen among starving children during African famines. At least that’s what her hospital claimed in the bill it sent to Medicare, records show. But Courtois, 64, says she wasn’t treated for malnutrition during the five days she spent at Shasta Regional Medical Center after she was hurt in a fall. She’s overweight, not emaciated, she said. And she said she never heard the word for the malady – a virulent illness with symptoms including emaciated arms, a distended belly and distinctive swelling of the feet or legs – until asked about it by a reporter. The former patient’s account is supported by Medicare and hospital records reviewed by California Watch, but disputed by Prime Healthcare Services, which owns 14 California hospitals, including the 246-bed facility in Redding. In an analysis of more than 50 million Medicare patient records over the past year, California Watch has found thousands of cases for which Prime has aggressively billed for treating unusual conditions. Medicare pays providers significant bonuses for treating patients diagnosed with hundreds of major complications, including kwashiorkor. Reports of kwashiorkor at Shasta Regional Medical Center exploded after Prime acquired the hospital in November 2008. That year, the hospital reported only eight cases of kwashiorkor. But in the two years that followed, 1,030 cases were billed to Medicare – more than 70 times the statewide rate for general hospitals. In Courtois’ case, the hospital’s reimbursement from Medicare increased by more than $6,700 – from $4,708 to $11,463 – by noting kwashiorkor on the bill, according to a California Watch analysis of billing information obtained under the federal Freedom of Information Act. Citing physician notes and other internal documents, spokesman Edward Barrera said the patient was found to be suffering from a condition called protein malnutrition. He said she was evaluated by a nutritionist and provided with “diet counseling and diet adjustment” as part of her care. “The physicians and the senior dietician did all they could to identify and treat this patient’s medical conditions,” he wrote, and it is “misleading and unfair” to suggest otherwise. But nothing in the 63-page file Courtois was given when she requested her hospital records indicates that she was seen by a nutritionist or treated for malnutrition. The word “kwashiorkor” doesn’t appear in the records. The phrase “protein malnutrition” isn’t in there, either. Courtois’ daughter, Julie Schmitz, supported her mother’s account, saying Courtois was never told she was malnourished or suffering from kwashiorkor. The Redding case comes as Prime’s billings have attracted official concern. Last year, Democratic U.S. Reps. Henry Waxman of Los Angeles and Fortney “Pete” Stark of Fremont asked Medicare officials to investigatesuspected fraud at Prime in connection with a reported surge in cases of blood infections. In October, Democratic U.S. Rep. Bob Filner of Chula Vista asked Medicare to probe the chain’s billings for “startlingly high rates” of severe malnutrition, including kwashiorkor. And two former employees of the hospital chain told California Watch that the FBI had contacted them this month about Prime’s billing practices. 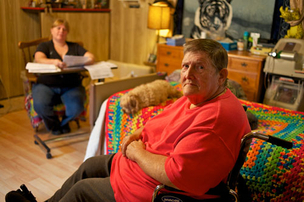 In 2010 alone, Shasta Regional reported that 727 Medicare patients – 19.4 percent – were suffering from kwashiorkor. That year, more than 1 in 3 kwashiorkor cases in the entire state’s Medicare population were reported at Shasta Regional, the records show. Prime officials have insisted that their Medicare billings are accurate and in full legal compliance. The kwashiorkor diagnoses show that Prime is serious about the problem of malnutrition among the elderly, officials have said. In his letter, Prime’s spokesman suggested that imprecision in Medicare’s own guidelines for hospital coding – translating medical conditions into computerized billing codes – could force a kwashiorkor diagnosis. When a patient has a low level of the blood protein albumin, a diagnosis of “severe protein deficiency” is appropriate, he asserted. Prime officials have contended that in cases of severe protein deficiency, Medicare requires hospitals to assign the diagnostic code for kwashiorkor, “even though the hospital did not document kwashiorkor as the diagnosis,” as they wrote in a memo earlier this year. Courtois was not an isolated case. Records show that a Medicare patient admitted to Shasta Regional Medical Center in 2010 for a possible stroke was neither diagnosed with nor treated for kwashiorkor. But information obtained via the Freedom of Information Act shows that Prime billed Medicare for treating this patient for the disorder. In an interview, the patient claimed never to have heard the word before, but declined to be named out of privacy concerns. And a former medical coder at Prime’s Desert Valley Hospital in San Bernardino County told California Watch in a previous story that she was pressured to write up patients for kwashiorkor if they had low albumin levels and were diagnosed with ordinary malnutrition. The diagnoses weren’t correct, the former coder, Vicki Presley Smith, said in an interview. Kwashiorkor is “basically in Third World countries; that diagnosis is very rare in the United States,” she said. Courtois worked for years as a teacher’s aide in Contra Costa County. Today, she lives in a forested area west of Lassen Volcanic National Park, and her daughter and son-in-law live nearby. Courtois is diabetic. The illness has caused serious kidney problems, and she undergoes regular dialysis. She has heart issues as well. In early 2010, Courtois fell from a chair while hanging decorations for a party and went to Shasta Regional Medical Center by ambulance. X-rays showed no broken ribs, and she was sent home. But she had episodes of dizziness and weakness, and on Jan. 29, she went back to the hospital via ambulance. According to her hospital records, an emergency room doctor described her as “well developed, well nourished,” and he noted “no edema,” which is the swelling of the feet and legs. That’s potentially significant. If a patient has kwashiorkor, physicians expect to see symmetrical edema, or swelling, on the lower limbs, and working upward as the disease progresses, three experts told California Watch. After Courtois was admitted to the hospital, another doctor examined her. He didn’t note any edema or malnutrition and agreed she suffered from acute kidney failure. In dictated notes, he said he would keep her on intravenous hydration and consult with a kidney specialist. Five days later, Courtois went home. A doctor who examined her before she was discharged said she was feeling better after an attack of kidney failure. He listed some 14 medications to take upon discharge, most of them drugs to control heart problems. Once a patient is stabilized, doctors normally provide nutritional supplements and antibiotics because kwashiorkor victims are prone to serious infections. Courtois said she did not receive nutritional supplements. Courtois signed a waiver allowing California Watch to obtain her Medicare billing information from the Centers for Medicare & Medicaid Services. In the bill it submitted to Medicare for Courtois, the hospital used a numeric diagnostic code to report that Courtois had been treated for acute kidney failure. As a complication, the hospital noted the numeric code for kwashiorkor. Experts say that if a patient has kwashiorkor, intervention is critically important. That’s because it’s a “high-mortality, high-fatality disease,” said Marie-Sophie Whitney, senior nutritionist for the international humanitarian organization Action Against Hunger. Treatment typically begins with the therapeutic milk product called F-75, which was invented specifically for severe malnutrition, said Jessica Tilahun, a nutrition adviser for the U.S. Agency for International Development. People with kwashiorkor are very ill, she said, and must be monitored carefully. “Their body is in such a state of crisis… they have to sip because if they eat too much too fast, it will alter the electrolytes in their body and can send them into heart failure,” Tilahun said.